One of my favorite healthy breakfasts, especially in winter, is a bowl of oatmeal. If I'm in a really big hurry, I'll have a packet of flavored instant oatmeal, but I find it really doesn't take long to make some Quick Oats on the stove. The benefit of doing this is that I can control the amount of added sugar. It can be made into a really hearty breakfast by adding in dried fruits, nuts, etc. My very favorite combo (and I have to give credit to my brother-in-law for introducing me to it) is banana, almond and raisin. The biggest benefit to this combo is that the bananas and raisins make it sweet and I don't feel the need to be in ANY sugar at all. 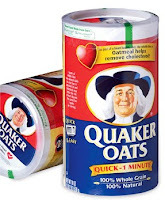 Right now, you can print a coupon for $1 off Quaker Instant Oatmeal, Quaker Quick Oats or Quaker Old Fashioned Oats product. Click HERE to print your coupon.